Whenever a game has gears, cranks or monocles, the term "steampunk" gets tossed around liberally, but how many games actually use steam as a key gameplay component? In Vessel, steam is kind of a big deal, and so is the water and molten metal you’ll mix to create it. 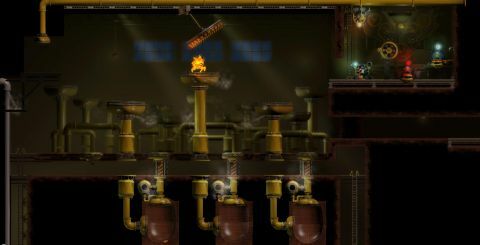 Playing as M. Arkwright, a brilliant but big-headed inventor locked out of his own factory, you’ll need to manipulate these raw elements to regain control over your own complex machinery. Vessel is a puzzle-platformer with an emphasis on the former. It’s less kinetic than classic titles, more focused on having you manipulate levers and fill boilers with your water cannon. After all, our inventor hero doesn’t need to double-jump and squish foes with his boots, he’s got inventions for that. The creatures you’ll encounter in Vessel are called Fluros, elemental automatons of Arkwright’s own design. They’re infinitely helpful around the factory, especially when there’s an out of reach lever that needs pulling or a pressure plate in need of pressing. Yes, these creatures are the ones who locked you out of the factory, and now they’re running amok with your machinery, but Fluros are not your enemy. They’re closer to a force of nature in need of wrangling, like the brooms in Fantasia. Sometimes you need them, sometimes you have to stop them. This is part of Vessel’s unique tone. While not as poignant as many of today's critically acclaimed indie platformers like Braid or Limbo, it’s funny, strange and engaging. Your standard water Fluros are simple and delicate. They’ll rush toward whatever switch needs an operator, and if you happen to be in the way, they’ll spatter themselves across your vest like an errant Jell-O mold. This won’t hurt, but if you needed that Fluro’s help, you’ll have to replace him. Getting a machine operational often means staying out of your Fluro’s way. When you start making Fluros out of molten metal however, dodging them becomes a dance of narrowly-avoided death. Still, when the platforming gets intense, you’ll see Vessel’s forgiving side. You can take far more steps in hot lava then Mario ever could, and an encounter with a bed of spikes is not always instant death. It feels like compensation for Vessel’s controls, which are loose, especially when it comes to movement. With either the mouse and keyboard or an Xbox 360 controller, aiming your water cannon is sharp, but running, jumping and climbing is pretty lead-footed. Thankfully, the gameplay generally doesn’t require pinpoint movement, but this is one of the few places Vessel lacks polish. Puzzles are Vessel’s real triumph and source of challenge. They’re brilliant brain teasers that the game steadily prepares you for. New Fluros and methods to produce them are thoughtfully introduced, and you’ll put these techniques and technologies to work before facing a complex “boss” puzzle. Some of these are head-scratchingly difficult, and the solution may only come to you after putting down the controller and doing something else. This is how you know Vessel’s puzzles are truly ingenious; you might solve one in the shower or while walking the dog. There’s real artistry in Vessel, but the density of its visuals can be distracting. The three main types of locations are factory, forest and mine, and each has its own beautifully detailed backdrop. They look great, but in dark areas the density can make crucial devices hard to spot. You may waste time on an impossible jump because you overlooked a ladder amongst all the gorgeous distractions. This is way more of a blessing than a curse, but it’s worth pointing out in light of Vessel’s other pacing issues. Vessel may look good, but it sounds even better. Its electronic score alternates between soothing and eerie, and piles on new musical layers as you work through challenges. The music deepens the sense of discovery, it can put you in awe or get you giddily excited for the next piece of the puzzle. Some players may be put off by the patience Vessel can require, but it offers massive rewards for your time. Solving its puzzles feels like a 1,000 watt light bulb flicking on in your brain. It’s a title best played in bursts, so you can quit when you’re stumped and then revisit challenges fresh. Mature pacing and borderline clumsy controls can be a difficult combination, but the visuals, music and brain-bending challenges make for a really satisfying overall experience. Puzzle gamers and fans of challenging indie fair will eat it up, but for average gamers it’s absolutely accessible, just be prepared to chip away at it, not breeze through. Vessel is the perfect Rubix cube to pick up in-between rounds of Horde Mode or long grinds. Grab the demo from the game's steam page, its well worth a look.